Everyone has heard of the famous fictitious detective, Sherlock Holmes. Sherlock Holmes is a recently released movie that has caught the attention of many people from ages 13to and older who likes a good mystery. 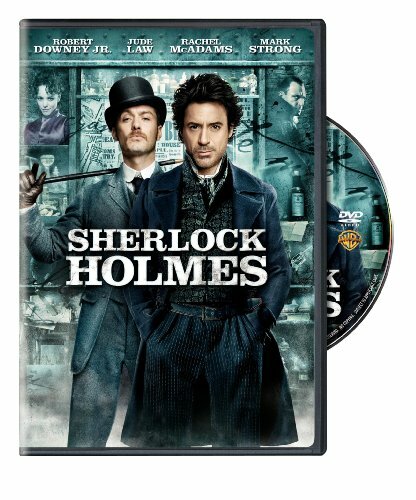 Robert Downey Jr. plays Sherlock Holmes in this film. Do you like action, mystery, or maybe even comedy movies? If so, you might want to check this one out. In the film, Sherlock Holmes and Dr Watson, his friend, defeat Lord Blackwood. Lord Blackwood was sentenced to be hanged for the use of black magic! But when a villager sees Lord Blackwood walking around the grave yard after being pronounced dead, things get a little suspicious. Lord Blackwood then goes on to try and kill more innocent people. So Sherlock Holmes and his partner, Dr. Watson, must catch Lord Blackwood before anyone else is killed. But while Sherlock is in the middle of this case, the love of his life, Ms. Irene Adler is trying to keep him from figuring the mystery out. Will Sherlock find Lord Blackwood and send him to his death? Watch the movie to find out! There are basically four main characters. Sherlock Holmes is the detective who uses his skills and mind to figure out how to catch the evil villain. Dr. Watson is Sherlock’s friend and serves as his assistant when solving mysteries. Lord Blackwood is the evil villain in this story, and his mission is to kill as many people as possible. Ms. Irene Adler and Sherlock Holmes’s relationship is very complicated. They love each other, but she is working for the villain. If you like action-packed mystery, then this is the movie for you! Sherlock Holmes is rated PG-13, so if you’re under 13, you might want to take a parent or guardian with you to see it. Don’t worry; they will love the movie too. If you want to find out what happens to Sherlock Holmes, go watch the film in theatres today! This article has 60 comments. I love Sherlock Holmes! I've seen the movies, read the books, and watched the TV show on BBC! It was Professor Moriarty, and yes, he was in the movie. That's who Adler was working for, but he came into the second movie a lot more. [Frodo] How do you pick up the threads of an old life? How do you go on... when in your heart you begin to understand... there is no going back? There are some things that time cannot mend... some hurts that go too deep... that have taken hold. [Pippin] I didn't think it would end this way. [Gandalf] End? No, the journey doesn't end here. Death is just another path... One that we all must take. The grey rain-curtain of this world rolls back, and all turns to silver glass... And then you see it. [Pippin] What? Gandalf?... See what? [Gandalf] White shores... and beyond, a far green country under a swift sunrise. [Pippin] Well, that isn't so bad. [Gandalf] No... No it isn't. [Frodo] I can't do this Sam. [Sam] I know. By rights we shouldn't even be here, but we are. It's like in the great stories, Mr. Frodo, the ones that mattered. Full of darkness and danger they were, and sometimes you didn't want to know the end, because how could the end by happy? How could the world go back to the way it was when so much bad had happened? But in the end, it's only a passing thing, this shadow. Even the darkness must pass. A new day will come, and when the sun shines it will shine out the clearer. Those were the stories that stayed with you. That meant something. Even if you were too small to understand why. But I think Mr. Frodo, I do understand. I know now. The folk in those stories had plenty of chances of turning back only they didn't. They kept going. Because they were holding onto something. [Frodo] What were they holding onto, Sam? Although I do agree with some of your opinions, it does sound like you're trying to create a commercial for this movie. I feel that this article coud have been more welll organized. I also feel that this article couldve been written in a more mature way rather than written to an immature audience. This is not the best review I have ever read. It doesn't flow, it is rife with gramatical errors and it gives away the ending. None of the characters are explained well, the summary is lacking and it uses far too many exclamation points. Overall, this is a poorly written article. Loved this movie was very entertaining and definetly was one of the better ones to come out. and yes i do agree that the post seems to just be copied from the paragraph on the back of the movie case. I absolutely loved this movie. Your review was good. The mistake was that it seemed like you just copied from the paragraph on the back of the DVD case. Other than that, good review and awesome movie. I absolutely loved this movie. It had my two favorite genres in one show(action & comedy). Unfortunately, the movie didn't have Sherlock Holme's original villian. I think it was Professor Mordiasse, but I really don't know. By the way, good review. Sorry, but the 1st time I read this i didnt really get the gist of it because I was so busy picking up on fallacies in the grammar and sentence structure. The second time I read it, I found it very much a summarisation, not reallyexplaining the plot. It was more of part blurb you would find on the back of the DVD case and partly something you would find on advertising posters outside hmv or the cinema. Too much summarization, I'm sorry to say. The movie was fantastic, though, even with some corny parts to it. Nevertheless, who can't help loving Holmes? There are too many to choose from. You didn't really review it did you? You just summarised the plot (fairly poorly) and used the old "If you love.........., then you should definitley go to see........ .
"Life isn't about just waiting out the storm. It's about learning to dance in the rain." I actually went to the set of Sherlock Holmes. I saw them film little bits of the scene on the bridge at the end. THe movie was actually amazing. Great review. Very articulate and the point is made. Oneday you life will flash before your eyes. Make sure its worth watching. "We few, we happy few/we band of brothers/For he to-day that sheds his blood with me/Shall be my brother"
Not the best review, but I did love the movie. It was full of mystery and action, but comedy relief as well. The best part, I think, was the revolution of the character of Dr. Watson. Before, he'd always been the sidekick who can barely keep up, but he was different in the new movie. I wasn't a big fan of the movie, i found it very confusing and fast paced, but i did like your review it was written very well. i LOVED this movie! its now on one of my top fav movie list!! !